My role is to help you implement the healthy diet and lifestyle changes necessary in order to heal yourself and to achieve wellness. Health Coaching focuses on healing on multiple levels including physical, mental, spiritual, and emotional. My approach towards coaching is 100% client focused. Because each of my clients face different challenges, and have different needs, health concerns, and areas of focus, I cater my approach to help you identify where you feel you need to make a change and help you apply those changes to your daily life. But, What is Functional Medicine? 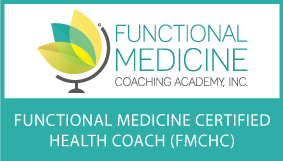 Functional Medicine focuses on identifying and treating the ROOT CAUSE of disease. Most of what we are going to be looking at is how our food and lifestyle choices faciliate healing and wellness. Our guts house a large majority of our immune system, therefore we keep a strong focus on gut health. You may not know that you are eating inflammitory or trigger foods and that they can exacerbate the symptoms of disease. Simply removing this foods can help facilitate healing. Rather than focusing on diagnosing DYSFUNCTION within the body, Functional Medicine works towards the body achievieng optimal FUNCTION.